An example of the finest quality Limoges enamel, this object is in brilliant condition and no similar plaque is known. The plaque depicts three saints rising from their graves (as described in the Gospel according to Saint Matthew 27.52-53) and scrolling plant decoration on a background of rich blue. It possibly comes from a crucifix of which another part is in the Walters Art Gallery, Baltimore. The two objects share several common decorative elements, including the use of a pseudo kufic script. An oblong plaque, Champlevé enamel on copper-gilt. 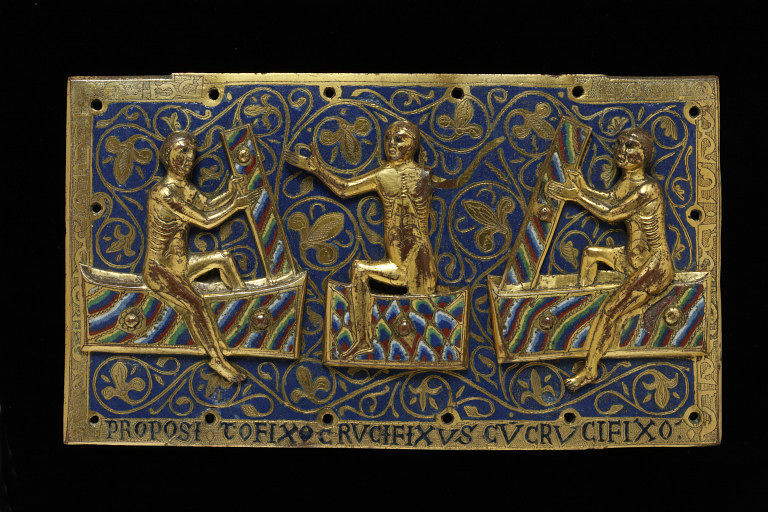 The plaque depicts three saints rising from their graves (as described in the Gospel according to Saint Matthew 27.52-53) and scrolling plant decoration on ground of rich blue. The two end saints lift the lids of their tombs, while the central figure steps forth holding both arms aloft. The lower border is decorated with half a verse, the sides with pseudo kufic script. Half verse running left to right along the lower border. A rhyming Latin hexameter continued from an upper plaque showing the Crucifixion. A letter in departmental records from Major B. Fairfax-Lucy, reports that the plaque was previously at Charlecote Park House in Warwickshire having probably been brought to England by a member of the Lucy family. Bought by the museum from Sir Montgomerie Fairfax-Lucy in 1945. Historical significance: An example of the finest quality Limoges enamel, the object is in brilliant condition and no similar plaque is known. An individual version of Cufic frequently appeared on medieval enamels. 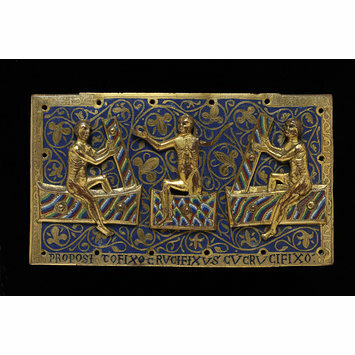 Other examples include two ciboria one in the British Museum and the other in the Louvre and a reliquary chasse known as the chasse de saint Calmine. The enamels ornamented in this way are usually dated to the second quater of the thirteenth century. An ultimate Spanish origin for the deocration seems probable, and it is possible that jewish craftsmen were partly instrumental in in spreading the idea of using non-Christian characters. The actual patterns vary very little. Possibly from a crucifix of which another part is in the Walters Art Gallery, Baltimore (museum number 44.22) The Baltimore plaque depicts the Virgin Mary, scrolling plant decoration and a border of pseudo kufic script, many elements of which match the present plaque. as recounted in St Matthew’s Gospel. Border with the latter half of a verse; proposito fixo crvcifixvs cv crucifixo, and simulated inscription in the Kufic characters.